Lone Simonsen is a professor of population health sciences, at the Department of Science and Environment at Roskilde University in Denmark, following an EU-funded Marie Curie Action funded visiting professorship at University of Copenhagen. She also holds a position as Research Professor in Global Health at George Washington University in DC. After her masters degree from Roskilde Univeristy, she pursued a PhD in population genetics from University of Massachusetts, Amherst and later trained at the Centers for Disease Control (CDC) in infectious disease epidemiology. She is an elected member of the Danish Royal Academy of Sciences & Letters and the American Epidemiological Society AES. Over the past 20+ years she has worked as a researcher at the CDC, World Health Organization (WHO) and NIH on issues including unsafe medical injections, global patterns of HIV/AIDS, Tuberculosis drug resistance, SARS, pandemic influenza, e-health data, surveillance systems and vaccine program evaluation. Before moving to academia in 2007, she was a senior epidemiologist at the National Institutes of Health-NIAID. She was a senior fellow with the RAPIDD modeling research network hosted by the Fogarty International Center 2009-2016. She has published over 200 peer-reviewed papers, book chapters and commentaries, with a rich global collaborative network of researchers. Her research currently focuses on modeling the spread and burden of historic and contemporary pandemics and emerging infectious diseases, population transitions in health, pandemic threat evaluation (influenza, ebola, SARS etc), and evaluating impact of national vaccine programs for the Gates Foundation. She also studies “big data” issues; in 2013 she coauthored a critical analysis of Google Flu Trends that led to its demise as an influenza surveillance tool; in 2016 she edited and contributed to a JID special issue on “big data” in infectious disease surveillance. 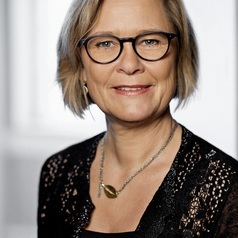 Simonsen is a frequent speaker at national and international meetings and served on an influenza expert panel for the Council of Foreign Relation. She also WHO multi-country effort to model the 2009 global pandemic burden and co-hosted international Historic Epidemiology meetings in Copenhagen in 2010 and 2014,plus an international Ebola modeling meeting at the Fogarty-NIH in 2015-2017 and a 1918 Pandemic Centennial meeting in Madrid, Spain..